There are a lot of things to think about when choosing a bunk bed for your kids. There are ladders, stairs, mattress sizes, and storage to consider as well as materials and whether or not you can separate them into separate beds if you need you. Don’t worry. We researched some of the best bunk beds with stairs and simple designs out there and put together this guide to help you find the perfect bunk. First, let’s look at some key features. Material: We included a few different materials here. Most of our picks are made of wood, but they’re not all solid wood. Some use MDF and composites, too. We also found a few really great metal frames to consider. Access: There are only 2 ways to access the top bunk: a ladder or stairs. Those that use ladders are all designed to be perfectly safe. That said, if you have very small kids, stairs may be a better option. Size: Here’s where it gets a little exciting. There are a few different options, including twin-over-twin, twin-over-full, and even queen-over-queen. Can you believe it? Queen sized bunk beds! Admittedly, they’re not for everyone so, don’t worry, there’s a lot to choose from. Finish: Those bunks that are made of wood usually come in a few different finishes, anything from merlot to honey to black. The metal frames aren’t as versatile, but you do have some options if you want something other than silver. Dimensions: This is an important thing to consider, especially if you don’t have a lot of space. Also, keep in mind that full bunk beds with stairs might seem too big, but they might have integrated storage that saves room elsewhere. Warranty: Some of these beds don’t come with a warranty and those that do are covered anywhere from 60 days to a year. Make sure you read all the details so you know what’s covered and what isn’t, just in case. Now that you know what to look for, let’s move into the best bunk beds. Here’s how it works. We put our top and budget pick right at the start of the list so you’ll be sure to see it, even if you’re in a hurry. These 2 products give you a really good idea of the variety available. Move further down the list if you can. All of these products are really unique. Alright, ready to get to it? Let’s go. Our top pick is the Dorel Living Brady Bunk Bed. 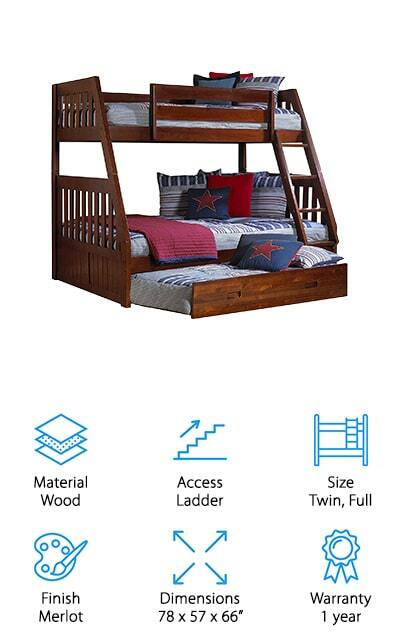 This twin-over-full design is made of sturdy wood construction and features an easy-to-climb 4-step ladder to reach the top bunk. There’s an upper guard rail for extra safety, too. Siblings will love this bed and there’s even enough room for a friend to sleep over, too. This set doesn’t require a box spring and the support slats are included. One of the great things about this bed is that you can easily unstack it and use it as 2 stand-alone beds when your kids don’t want bunk beds anymore. Each bed can hold up to 165 pounds. There are a lot of color options available, too, so you can match your decor. Choose from black, espresso, graphite, gray, and white. Next up is the Caribou Bunk Bed from Storkcraft. It’s made using solid rubberwood and composites. Rubberwood is much denser than pine making it exceptionally durable so this bed will last a long time. 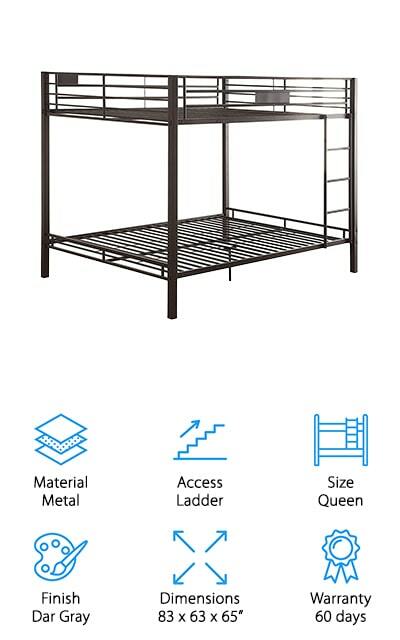 The sturdy 4-step ladder is easy to climb and the top bunk features full-length guard rails for added safety. One of the great things about this bed is it will grow with your children. Why? Because you can separate it into 2 twin beds when the time comes. These beds fit a standard twin mattress and are not meant to be used with a box spring. Slat roll mattress supports are included. There are 4 different finishes to choose from, too, so you’ll be able to match just about any decor. Choose from white, gray, navy, or espresso. If you have a lot of kids or a set of triplets, you’re going to love our next pick. 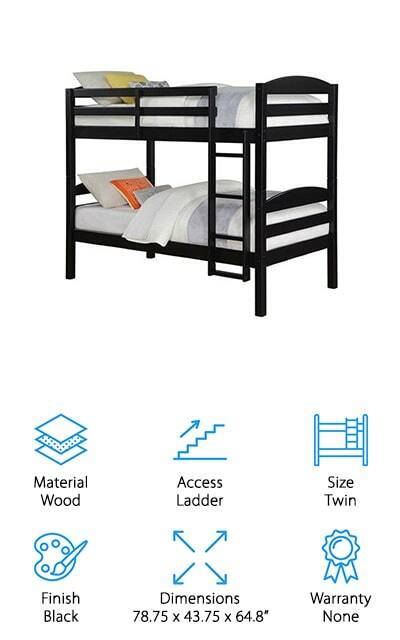 The Dorel Living Triple Bunk Bed sleeps 3 without the use of a trundle. The top 2 bunks each have their own ladder for access and each bunk supports a standard twin sized mattress. Slats are also included since these beds don’t use box springs. The solid wood construction not only looks great, but it’s also really durable. It comes in a classic warm mocha finish that will go with just about any decor. You might be wondering if it’s safe. Well, it meets all US safety standards and the middle and top bunk each feature a guardrail to help prevent any falls. One more thing: it also converts into 3 twin beds. Next up is another great option, especially if you’re looking for a bed that sleeps 3. The Discovery World Furniture Bunk Bed is a twin over full design that also has a twin-sized trundle bed underneath. This is a great space-saving option if you’re trying to fit 3 kids in a bedroom or if you just want an extra place for sleepover guests to sleep comfortably. This bed is made of solid wood and is extremely strong. So strong, in fact, each bed can hold as much as 350 pounds. That also means that this bed will definitely grow with your kids well into their teenage years, making it a really great investment piece. The beds can be separated into 2 twins and are available in 3 different finishes: espresso, honey, and Merlot. 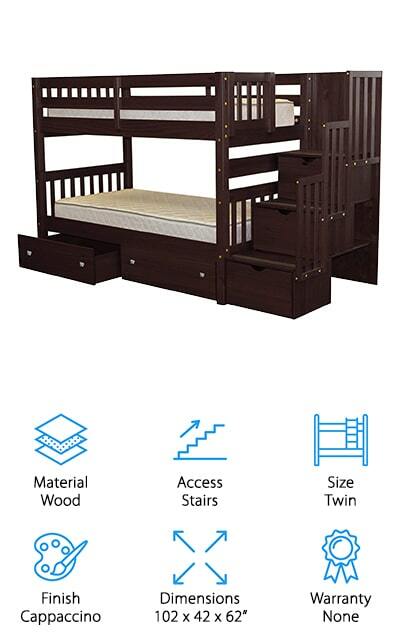 Bedz King Stairway Bunk Bed is your best bet if you’re looking for solid wood bunk beds with stairs. This twin-over-twin design is made of solid pine and uses no particle board or MDF. It’s exceptionally durable. The stairway is safer than a ladder and provides easy access to the top bunk. That’s not all, if you’re looking for a bunk bed with storage, look no further. Not only does each of the stairs contain a drawer where you can put anything from toys to clothes, but there are also 2 wide, flat drawers under the bottom bed, the perfect place to stash warm blankets and extra bedding for when you need to get to them fast. Incidentally, this bed is also our pick for the best bunk beds with storage. 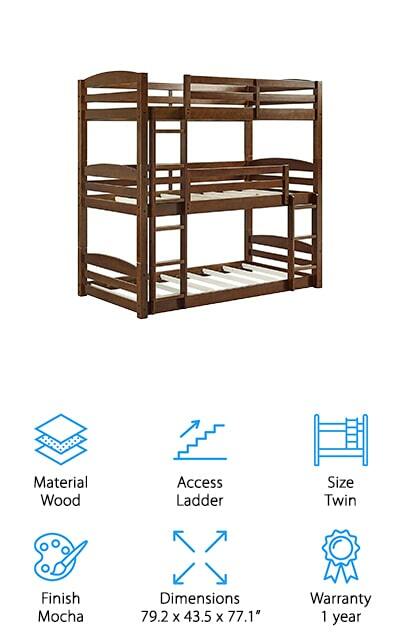 The Mainstays Wood Bunk Bed features a classic, simple design with clean lines and a 4-rung ladder. This twin-over-twin bunk features solid wood construction with curved headboards and horizontal slate as a tribute to its Craftsman inspired look. 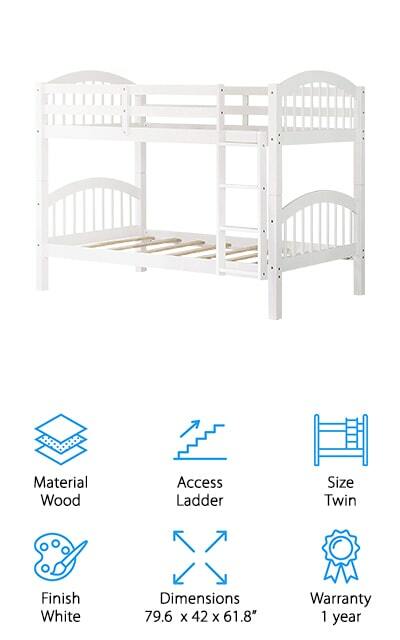 There’s a full-length guard rail on the top bunk for extra safety so you can breathe a little easier at night knowing your little one isn’t able to roll out of bed. 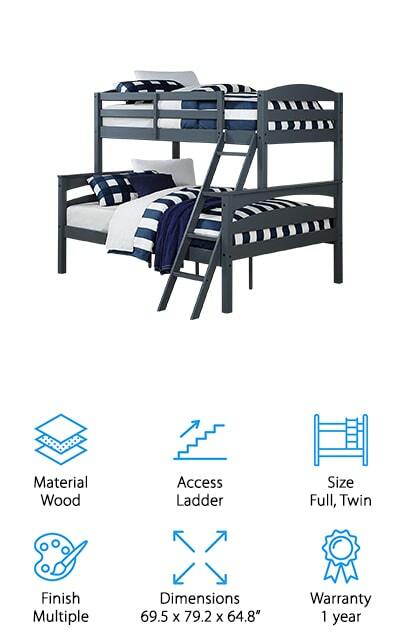 As your kids get older and decide they no longer want a bunk bed or if you give them each their own room, you can simply separate this bed into 2 stand-alone twins. This bed is available in a black finish that matches with just about any decor. It does not use box springs and the necessary mattress slats are included. 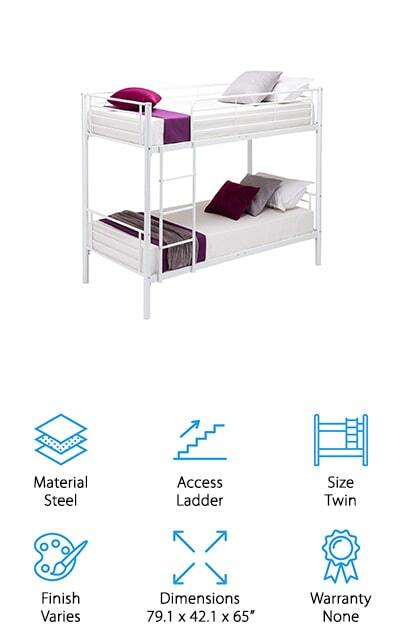 Next is the Mecor Metal Bunk Bed, a great choice if you’re looking for something a little different. It’s made using a sturdy steel frame that creates a really unique, modern look in any bedroom. The top bunk features a safety rail that’s more than 13-inches high to help prevent any falls. It also features an easy to climb ladder that can be mounted on either side of the bed, depending on the layout of the room. Your kids can use these beds for a long time. In fact, they’re strong enough to support large adults. The top bed can support 330 pounds, the bottom 440 pounds. This bed is available in 3 different finishes: white, black, and silver. One more thing, the assembly is really easy and the instructions are pretty clear. 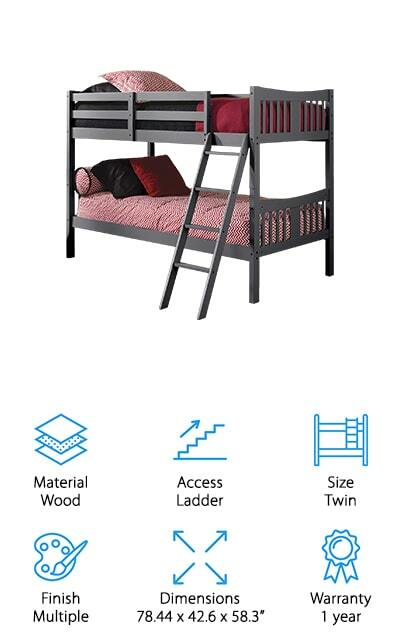 The ACME Kaleb Bunk Bed is something we don’t see a lot of. What exactly do we mean by that? This bed is actually a bunk that consists of a queen over a queen. If you’re looking for something that gives your kids more room or if you already have queen-sized mattresses and your kids are begging you for a bunk, this is the one for you. This simple metal design features clean lines and a black sand finish that has a modern look but will easily blend in with any decor. The 3-rung ladder is safe and easy to climb. That’s not all, it’s also reversible so you can customize it’s position to the layout of your room. One more thing, this bunk includes the necessary mattress support slats, too. Last up is the Harper & Bright Designs Bunk Bed. It’s made of solid wood and features a simple, timeless design with curved head and foot boards. This bed was specifically designed to be easy to separate into 2 twin beds so it can really grow with your kids to when they’re old enough to get their own room or just decide that they don’t want bunk beds anymore. You might be wondering how long your kids will be able to use these beds. Well, the top bunk can hold up to 250 pounds, the bottom holds up to 300. So, your kids really can use this bed for a long time. Other features include an easy-to-climb slanted ladder and guard rails around the top bunk for additional safety. Check out our budget pick if you’re looking for unique bunk beds for sale. 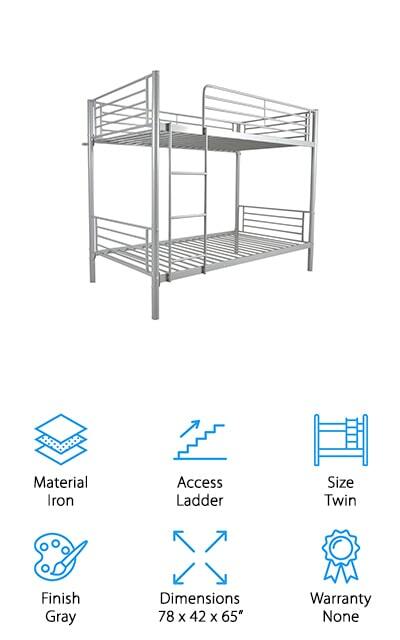 The high-quality durable iron steel tube frame has a much different look than more traditional wooden bunk beds so if you’re looking for something a little more stylish, this is a great choice for you. Not only does this bed look cool, but it’s also insanely strong as well - strong enough to hold adults so you can even use it in a small guest room if you wanted to. The top bunk has a weight capacity of 220 pounds, the bottom 330 pounds. That’s not all, the upper bed features a guardrail that’s more than 13-inches high for the utmost safety. Assembly is really easy, too, in part because the instructions are really easy to follow.